This is a mitate for chapter 39, Yugiri or 'Evening Mist', from The Tale of Genji. 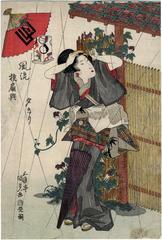 It shows a bijin adjusting her coiffure as she shelters under a porch from a sudden shower of rain. The artist's crest, the toshidama, appears several times in the lantern-form next to the fan in the upper left. There are two other prints from this series shown in black and white at the Ritsumeikan University archives. One of them relates to Chapter 15 of The Tale of Genji and is entitled Yomogi-fu. The other one is entitled Miotsukushi and relates to Chapter 14. This information would lead one to believe that this set of prints was rather large. It would be wonderful if we could locate the others.